My biggest local card show's also the largest in New England, held semi-annually at the Shriner's Auditorium in Wilmington, MA, about 15 miles north of Boston. It's a Fri-Sun show with lots of vendors and lots of vintage and is almost always worth the trip. I went to their spring 2016 show on April 16. My show strategy follows a recurring script of "what I say I'll do" versus "what I do instead." WHAT I SAY: "I'll walk the whole show first and a get a lay of the land before buying anything." WHAT I DO: "Oh, is that a 25c box near the door? Let's stop there right now." I couldn't resist a Twitter crack about "swapping" for this 1971 Fritz Peterson. 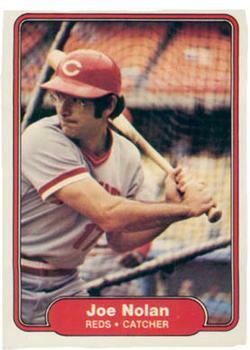 He and NYY teammate Mike Kekich famously swapped wives (permanently) on March 4, 1973. I'm not the first to think about that day in card terms. As Peterson put it recently, "it was a husband trade -- Mike for me and me for Mike." A prior collector took the time to hand-update this 1965 Colavito/Horton/Oliva AL leader card with their 1966 numbers. Only Detroit slugger Willie Horton was able to crack 100 RBIs in both seasons. The winner of this 25c box, a Concepcion RC. One of my OBC friends collects all the Concepcion cards he can get his hands on, so Davey will head his way. 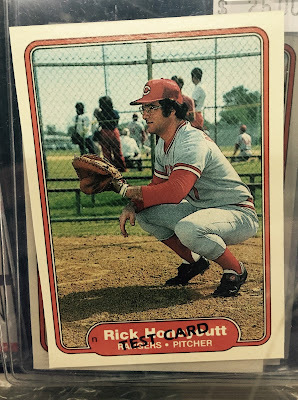 Many sets in my #5 collection are rare or obscure direct-to-collector issues, including a number of postcards, so I always watch for those specialists at vintage shows. One guy had a half-dozen photo binders and boxes of odd sizes. This 1976 photo of Cubbie Darold Knowles at Dodgers Stadium shows everything I remember about the 70s. Pillbox hats, horn-rimmed glasses, shaggy kid hair, and Kodak black-and-white. It's the classics, man, the classics. Vintage collectors might know J.D. McCarthy as the maker of an ongoing and comprehensive series of baseball (and other sport) postcards. This marked the first time I've seen J.D. 's own face in that same format. Want to know more about J.D.? 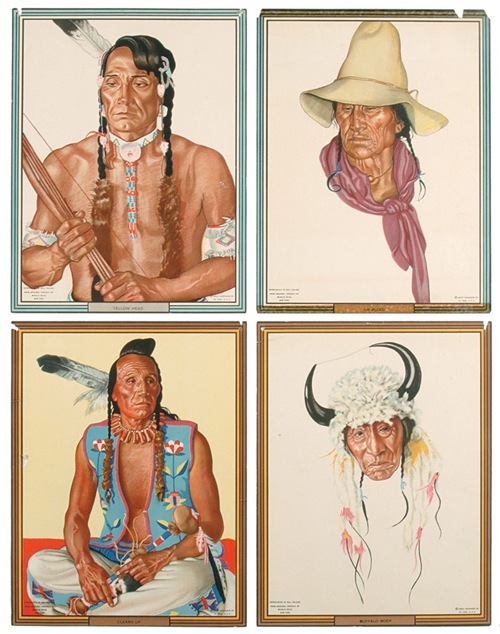 See Bob Lemke's article on acquiring McCarthy's photographic "estate." While McCarthy's passed on, baseball photographer Bob Bartosz continues to trade and talk baseball as of 2016. I found a handwritten postcard from one Bob to another, swapping cards the old school way. For much more on Bartosz, read this March 2015 article at Baseball Cards Come To Life! April 16 was also National Record Shop Day, so I was primed to enjoy this spread of 1960s Auravision records. If you can't find that Koufax record in a shop, it's now on YouTube! Some dealers aren't great at knowing what they have, or maybe just can't spell "Hillenbrand." 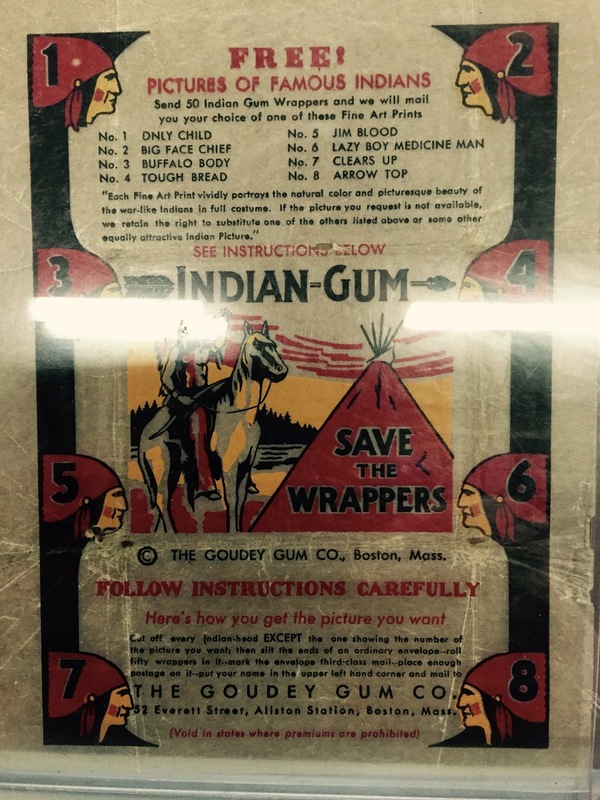 Last year, I dipped my toe into 1930s non-sport cards, which includes Goudey's very successful Indian Gum cards. I've thumbed through several hundred of them in the last year, but this was the first time I've seen a wrapper. Kids could trade 50 of them for "premiums" (larger pictures) of famous Indians, whose names would've been very entertaining to young me. 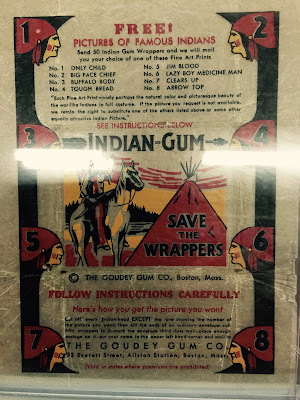 One reason wrappers are rare: those 1933 Indian Gum trade-ins (catalogued R74) are beautiful. Robert Edwards Auctions sold this group of 4 premiums for $1410 in 2009. I can only imagine what they'd fetch today. Another rarity: this 1982 Fleer test card, which shows Reds C Joe Nolan crouching over Rangers P Rick Honeycutt's nameplate. That photo's very "spring training" without his mask and Nolan's own card used a batting pose. 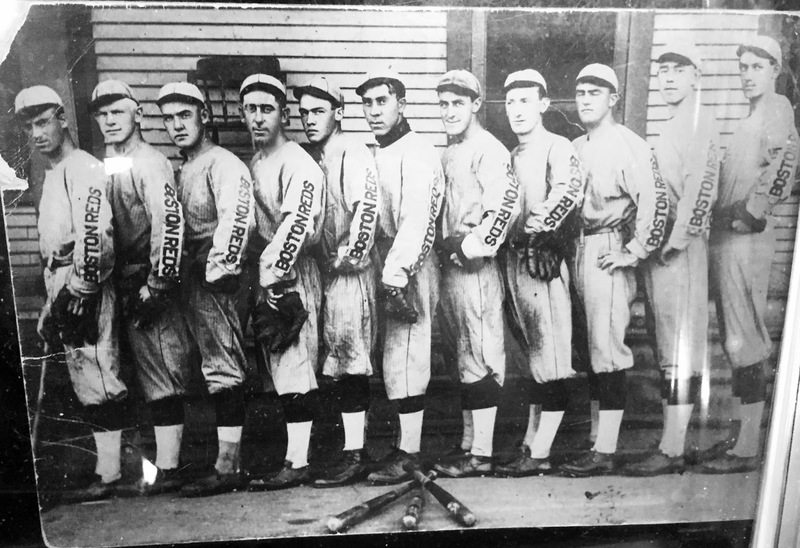 Another (pricy) photo find from a 19th century table, some Boston Reds. 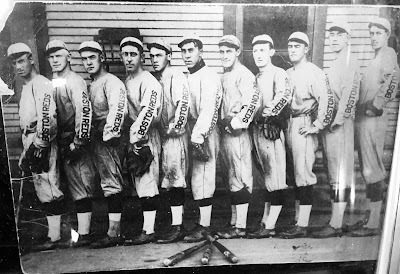 The modern baseball uniform evolved in fits and starts from 19th century woolens and this photo captures a Boston team (but not the 1890-91 Reds) that wore their name on their sleeves. I met up with friend-of-the-blog Mark Hoyle about halfway through my walk around. We chatted for awhile about the state of local collecting and he made introductions to good dealers he knew from other Boston-area shows. Mark was nearby for my "find" of the show, a nice chunk of vintage VG-EX singles loosely displayed in a case. "Those aren't in great shape," their young dealer said, "let's say a buck each." "Yes," I said, "here is my money." 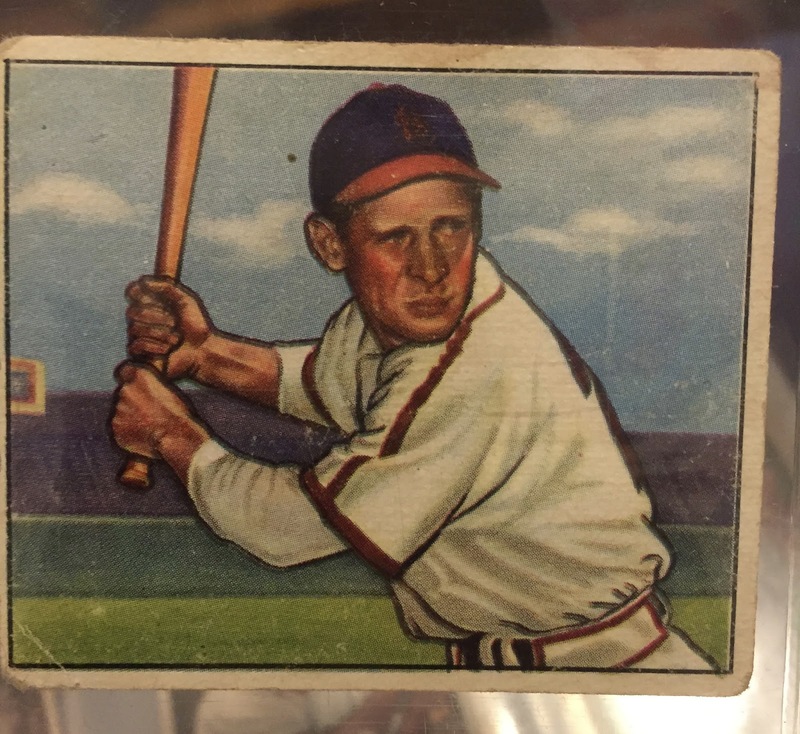 First was this 1934-36 Diamond Stars, which still had its die-cut back. $1 pre-war, helllooooo. 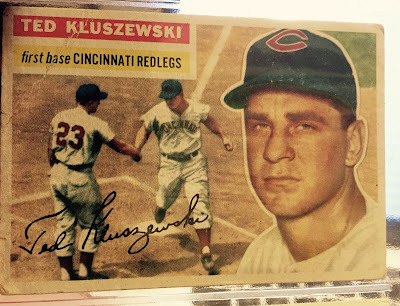 Above, "Big Klu" from my favorite set, 1956 Topps. Wrinkled, but an upgrade. Below, several Bowman upgrades, including Dodger skipper Chuck Dressen, who guided Brooklyn to pennants in 1952 and 1953. One 1950 Bowman upgrade, and a horizontal one at that: #36 Eddie Kazak. Throw in a 1950s Mantle Exhibit card ($5), 1940 Play Ball of Joe Cronin ($10), and you've got an OK day at the show. 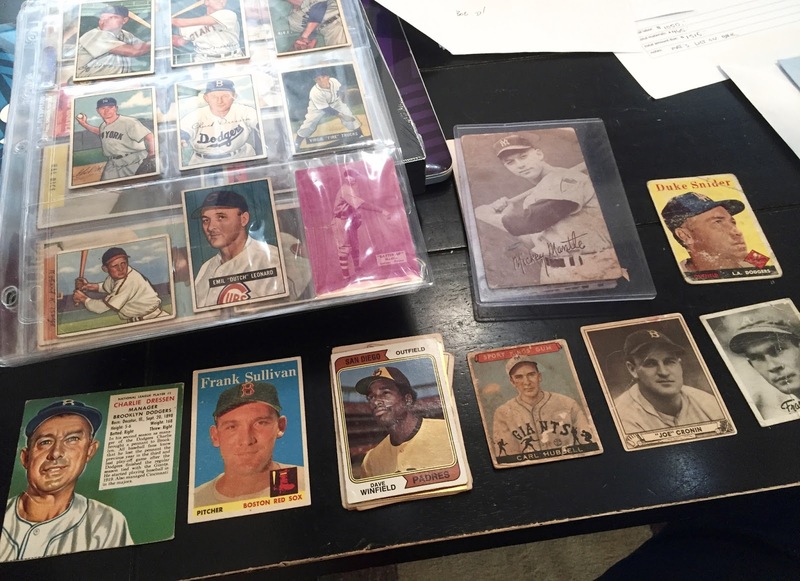 Those two at lower left, a Red Man of Chuck Dressen and 1958 Topps Frank Sullivan, came not from a card table, but from my dad's own childhood collection! He'd last sent me cards years ago, but somehow synched their arrival with show day. Nothing like a bit of good luck to go with an afternoon of walking through history. That's right, I picked up Pinky Higgins in my (likely endless) pursuit of a 1936 Goudey master set. Hope I can find all 175! Do you have photos of the set that included your Red Sox cup?